UPDATE NOON: Virginia Gov. Ralph Northam has lifted the mandatory evacuation order for residents in Zone A, following the National Weather Service lifting the tropical storm warning for coastal Virginia. WASHINGTON — Hurricane Florence is hitting North Carolina’s southeastern coast, causing a storm surge that is expected to last all day Friday. But that’s not the brunt of it yet. Hurricane-force winds are currently happening along the North Carolina coast and are expected to spread to portions of South Carolina later Friday. Watch a live stream as Florence rolls through the Carolinas. In Wilmington, buildings have been torn apart, parts of buildings have been flying through the air and power is out for much of the area as the storm barrels through, reports The Associated Press. Florence’s damage is forecast to last for hours, as it edges along at 6 mph and draws energy from the ocean. Florence’s center of the eye made landfall in Wrightsville Beach, North Carolina around 7:15 a.m. Friday. Maximum sustained winds were estimated to be 85 mph, said the National Hurricane Center. 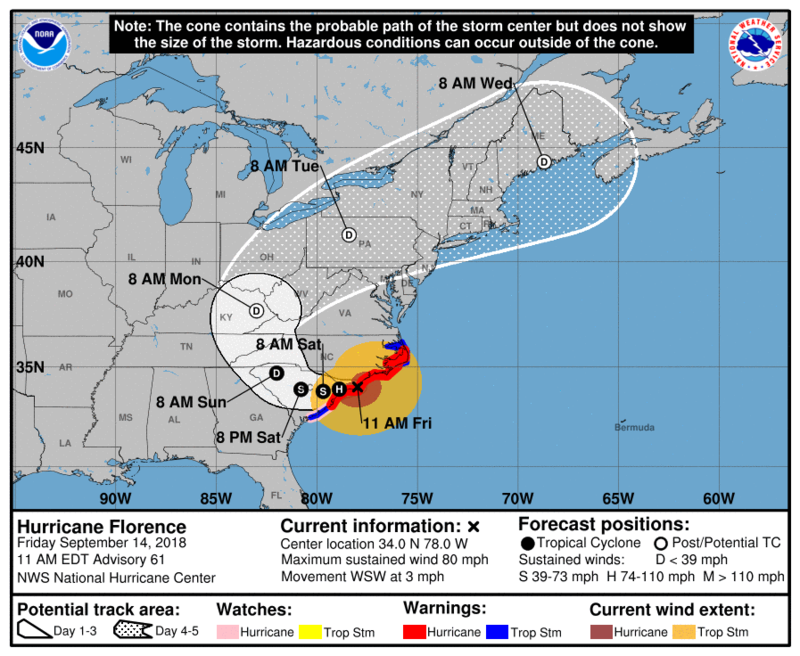 Florence, a storm that’s 400 miles in diameter, was downgraded to a Category 1 hurricane as of Thursday night, but the National Hurricane Center continues to urge people to be wary of the severe weather that is pummeling the area. Being downgraded to a Category 1 hurricane does not affect the storm surge that’s expected to reach 9 to 11 feet. A storm surge is already occurring in North Carolina and will continue through Friday night. Life-threatening, catastrophic flash flooding and prolonged river flooding are likely in the Carolinas and the Appalachians through early next week. “That’s one of the misnomers about slow-moving, large hurricanes, as is the case with Florence,” said Dennis Feltgen with the National Hurricane Center. The continuing pounding of hurricane-force winds from Florence–even at a slow pace–could push water farther inland. Feltgen said 90 percent of hurricane-related deaths are from problems that arise with the massive amounts of water. The storm surge will be near and to the right of where the eye of the hurricane made landfall. 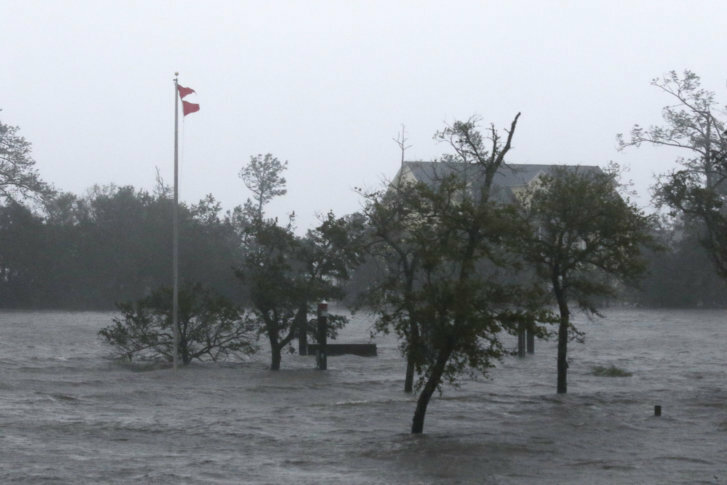 The worst of the surge amounts predicted along the North Carolina coastline are 9—13 feet above ground, Feltgen said. As of 11 a.m., maximum sustained winds were at 85 mph. Hurricane-force winds are currently happening along the North Carolina coast and are expected to spread to portions of South Carolina later Friday. Florence will be moving forward in a slow westward motion for the next 36 to 48 hours, said the National Hurricane Center. Wind data indicate that Florence has weakened and it’s expected to continue to weaken as it moves toward South Carolina. Florence’s expected slowdown means a prolonged period near the coast, said the hurricane center’s Joel Cline. It could then head west and southwest. Wilmington has already experienced its highest wind gusts since 1958, reaching 105 mph in the eye wall of Florence Friday morning. This breaks the 135 mph peak wind gusts that Hurricane Helene forced upon the area in 1958. Florence could dump 20 to 30 inches of rain in the span of three days along the Carolina coast and up to 12 inches inland. Isolated areas could get 40 inches. FEMA officials said the same amount of rainfall fell upon the area throughout a span of 14 days during Hurricane Floyd in 1999. The impact is expected to be similar to that of Hurricane Harvey on the Houston area last year, Feltgen said. The expected heavy rainfall would produce both flash flooding and river flooding that could in turn cause an environmental disaster, if the water inundates the region’s many industrial waste sites and hog manure ponds. “Because of the slow movement of the storm, the rain is going to have plenty of time keep piling up,” said Feltgen. And as the storm pushes inland, it could dump 6—10 inches as far inland as Charlotte and Raleigh in North Carolina as well as in Roanoke, Virginia, he said. Not far away in Wilmington, ABC correspondent Jim Ryan said a local Waffle House that has remained open had good business Thursday. In Myrtle Beach, ABC correspondent Pete Combs painted a starker picture of those who decided to stay in place. He said only about 300,000 of the 700,000 people who live in the mandatory evacuation zone left. As of Friday morning, federal officials are urging anyone who ignored evacuation orders to stay put until the storm passes. About 9,700 National Guard troops and civilians have been deployed with high-water vehicles, helicopters and boats. The Army Corps of Engineers will work to restore power, install temporary roofing and remove debris. Two amphibious Navy ships are on standby to respond and provide disaster relief after Florence moves through. Get live views from webcams along the coast. Virginia remains under a state of emergency. The southern portion of the Virginia coast is under a tropical storm warning — from north of Duck, North Carolina, to Cape Charles Light, Virginia, and the Chesapeake Bay south of New Point Comfort. 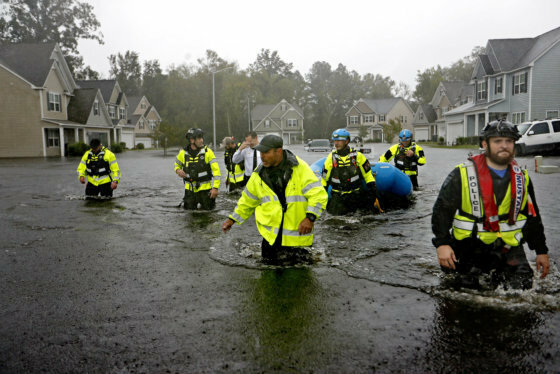 After it weakens inland, Florence is predicted to turn northward, raising concern about how additional rainfall — even from a significantly weakened storm — will impact the southwestern portion of the commonwealth, which is already waterlogged. “Those outer bands are just as destructive as areas that come close to the walls, so it’s going to be a very long overnight for a lot of people between Virginia all the way down to Georgia,” Dresner said. “This threat will continue into next week,” said Jeff Stern, Virginia’s state coordinator of emergency management, during a Thursday evening news conference. Virginia Gov. Ralph Northam reminded residents to stay off the roads and shelter in place. “Now is not the time to let down our guard,” he said. Maryland, too, remains under a state of emergency. Maryland Prepares mobile app, with real-time local information, is available for both Android and iOS phones. Virginia residents can sign up for state-issued emergency email alerts. D.C. residents can sign up for city alerts. WTOP staff and The Associated Press contributed to this report.